Nissan Qashqai vs Peugeot 3008 vs Renault Kadjar | What Car? The Nissan Qashqai has long been the go-to option for anyone seeking a small family SUV. It’s well made, quiet, cost-effective and impressively practical. It’s such a good all-round package that, in 2014, we voted it our Car of the Year. Renault, however, is looking to overthrow the fabled Qashqai with its new Kadjar. It’s cheaper and, thanks to a tie-up between Renault and Nissan, similar under the skin, using the same underpinnings, engines and more. Provided it can measure up across the board, it stands a good chance of pipping the Nissan to the post. The Peugeot 3008 has been around since 2009, although it’s been facelifted along the way; its new BlueHDi diesel engine brings lower CO2 emissions than the Nissan or the Renault. Given that the Peugeot is also the cheapest to buy and the most generously equipped, it stands a good chance of causing an upset. Predictably, since they share the same underpinnings and 128bhp 1.6 diesel engine, the Renault and Nissan are similar to drive. The Qashqai was slightly faster in our tests, but both offer punchy mid-range acceleration and feel equally at home driving around town or on motorways. The Peugeot’s new 118bhp 1.6 BlueHDi engine has a more linear and predictable power delivery, although it doesn’t get into its stride until it’s at higher revs – and even then its acceleration isn’t as eager. The 3008 falls short of its rivals on the handling front, too. This 1.6 model does without the Dynamic Roll Control feature of the 2.0-litre diesel, and it shows in the heavy lean you get through corners while the steering is overly light and too vague. The Nissan and Renault are far more wieldy and precise than the 3008, but there are differences between them. The Qashqai has better body control and more steering feedback, although some may prefer the Kadjar’s lighter steering around town. Both are pleasant enough to drive day in, day out, but the Qashqai feels a little more polished in general, and it also has the most comfortable ride of the three. Having said that, our test Kadjar came with optional 19in alloy wheels fitted (the Qashqai and 3008 were both on 18s) and this no doubt played a part in its slightly choppy town ride. The Peugeot is never truly uncomfortable, but it thumps and fidgets more than the others around town, and it jars more over potholes. It doesn’t seem to settle as well at motorway speeds, either. Refinement is what really separates the Kadjar and the Qashqai. While the Nissan is easy to drive smoothly, the Renault’s brake pedal is harder to modulate for a precise response, and its gearshift isn’t as positive or as slick – although the 3008’s rubbery shift and vague clutch response are even more disappointing. The Nissan is also the quietest of the three, with well-suppressed wind and road noise. The 1.6 diesel engine sounds quite gravelly in both the Kadjar and the Qashqai, but there’s a more noticeable noise in the Renault, making it the least peaceful cruiser here. The 3008 recorded the lowest decibel reading in our 70mph noise test, although it actually has the loudest engine of the three when you accelerate briskly. Space up front is similar in all of our SUVs, with loads of room for tall drivers and plenty of elbow room between the driver and passenger. Central armrests, lots of steering wheel and seat adjustment, and standard adjustable lumbar support ensure all three contenders are comfortable on long journeys. Both the Nissan and Renault have fairly classy and solid-feeling interior finishes, although the Qashqai pips the Kadjar with its better-perceived build quality and more premium-feeling materials. The Peugeot isn’t that far behind, although there are some cheaper feeling switches that make it feel a more cut-price option. The 3008 falls behind its rivals for rear passenger space, too, with the least leg and head room in the back; longer-legged passengers might find their knees touching the hard, plastic-backed front seats. It’s the best here for middle passengers, though, since it has a flat floor rather than the raised central tunnel that eats into foot space in the others. The Nissan and Renault are roomy enough for tall adults to get comfortable in the back, although the panoramic glass roof that comes on higher trims reduces the head room. The Peugeot’s glass roof, which is standard on the trim we’re testing here, also cuts into rear head room, but it does at least flood the cabin with light. With high-set seat bases and tall door apertures, it’s easy to bend in to access a child seat in all three of these cars. The Kadjar has the largest claimed boot capacity, although all the cars have false boot floors, seats that fold flat easily and bag hooks and lashing eyes aplenty. The Qashqai and Kadjar both have boot dividers, great for keeping shopping from rolling around, and wider boots than the Peugeot. However, the 3008’s split tailgate is a handy perch when you’re taking off muddy wellies. The Peugeot’s big discounts make it the cheapest of the three to buy up front. However, its resale values are the worst here, so it’ll actually cost you around £500 more than the Renault if you sell on after three years. The Nissan costs the most to own privately, but a three-year PCP contract (with a £5000 deposit and 12,000 annual mileage) will cost you £285 a month, compared with the Peugeot’s £329. However, the Kadjar beats them both at just £223 per month. The 3008 is the most affordable for company car drivers. If you’re in the 40% tax band it will set you back £1331 less than the Qashqai over three years, and £203 less than the Kadjar. We weren’t able to put the Renault through our True MPG tests, but we’d expect it to return a similar figure to the Qashqai’s at around 53.3mpg – considerably better than the Peugeot’s 48.8mpg. All three cars are well equipped, with climate and cruise controls, automatic lights and wipers, alloy wheels and LED daytime running lights. The Peugeot’s panoramic glass roof and head-up display earn it an extra star for standard equipment while it and the Nissan get some advanced parking aids, including front and rear sensors. The Qashqai received the maximum five-star Euro NCAP crash rating in 2014. The 3008 was also five-star rated but was tested in 2009 when the requirements were less stringent. The Kadjar is yet to be tested, but should protect you as well as the Qashqai, and includes the same automatic emergency braking system to help you avoid shunts in the first place. All three cars are equally highly rated for protection against being stolen and broken into, according to the security experts at Thatcham. Nissan and Peugeot finished ninth and 12th in our reliability survey of 37 manufacturers. Renault came 21st. The Kadjar is too new for reliability feedback, but we’d expect it to be similar to the Qashqai. 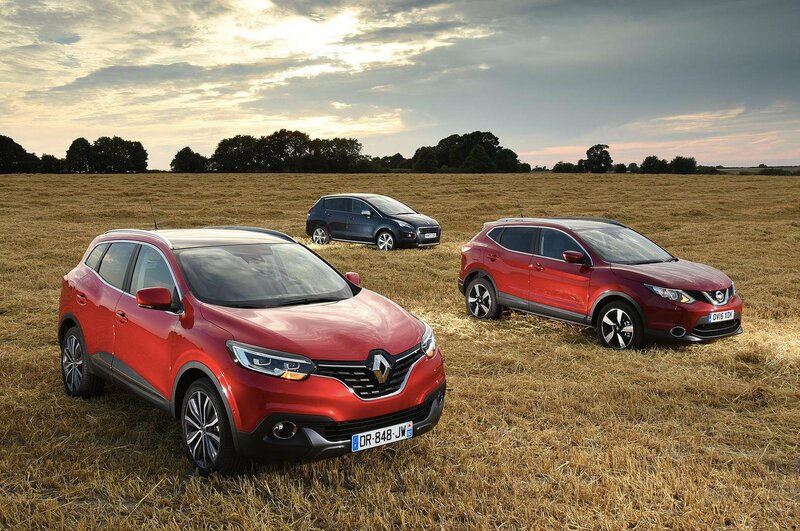 The Renault has a four-year warranty while the other two are covered for three years. The tricky thing here is choosing between the Nissan and the Renault. After all, they have many of the same merits, including a punchy diesel engine, impressive practicality and confidence-inspiring handling. Put simply, both are supremely fit for purpose. In the end, it’s the Qashqai that emerges as the winner. It’s more refined than its French rival, is easier to drive smoothly, thanks to its better brake and clutch pedal feel, and is superior in its ride and handling too. The Nissan’s slightly classier interior is also a factor, as is its impressive equipment, although it is the most expensive car here. The Kadjar comes extremely close to edging it, thanks to its cheaper price and lower PCP payments. Company car buyers may also find the savings offered by the Renault hard to resist although we think the Nissan’s greater talents are worth the price premium, however you’re buying. That leaves the Peugeot. Despite its age, the 3008 is still a likeable car, with a comfortable cabin that’s full of big-car features. True, it isn’t that spacious in the back, but provided you’re not carrying four adults on a regular basis, its interior is just as well suited to family life as the Qashqai’s and the Kadjar’s, and the standard split tailgate is a seriously appealing feature. The Nissan and the Renault are considerably better all-rounders, then, but the 3008 is worth considering if a low initial outlay or cheap monthly company car bills are your priority.